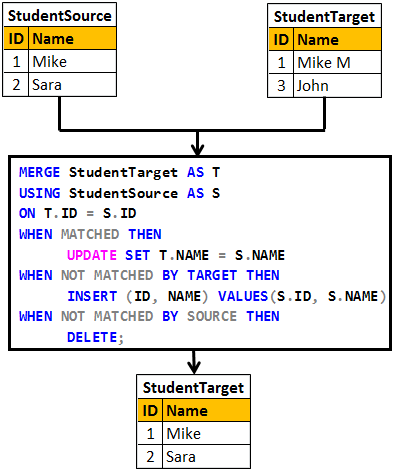 Merge statement introduced in SQL Server 2008 allows us to perform Inserts, Updates and Deletes in one statement. This means we no longer have to use multiple statements for performing Insert, Update and Delete. 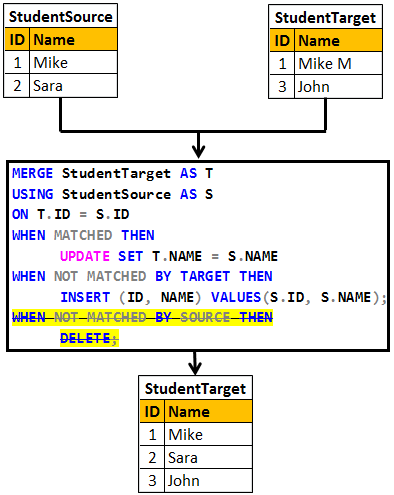 The merge statement joins the target table to the source table by using a common column in both the tables. Based on how the rows match up as a result of the join, we can then perform insert, update, and delete on the target table. In real time we mostly perform INSERTS and UPDATES. The rows that are present in target table but not in source table are usually not deleted from the target table. Example 2 : In the example below, only INSERT and UPDATE is performed. We are not deleting the rows that are present in the target table but not in the source table.